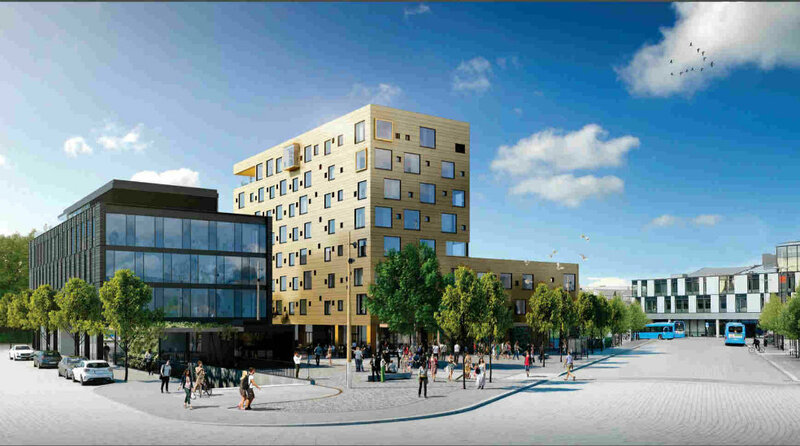 Welcome to Comfort Hotel Porsgrunn will be opening its doors to more than just accommodation. On March 1st 2019 our brand new hotel opened with 134 modern guest rooms, distinctive suites with private roof terrace, a fitness room overlooking the coastal town, an underground parking garage, and exciting and modern conference facilities. You are invited to a hotel where guests and locals can work, dine, have meetings and company in a relaxing atmosphere. Comfort Hotel Porsgrunn has opened right at the heart of the city, a stone's throw away from the train station and the bus terminal. Within easy walking distance of shops, restaurants, sights and public transport, you are as central as can be in Porsgrunn. Have yourself a healthy organic breakfast for the best possible start to your day, work out with the wonderful panoramic views from the 8th-floor fitness room, or relax in the lobby with a glass of wine or cup of coffee from the 24-hour Barception. Hold meetings, seminars or courses in one of our 6 modern meeting rooms, not to mention be able to stay in our comfortable hotel rooms. Everything at an attractive price! Comfort Hotel focuses on food that is simple, tasty, and good for both your body and the environment. In our Barception you will find nibbles, snacks, coffee, beer, and other tasty things. Our breakfast is a hybrid between a classic hotel buffet and a café breakfast. We have a green, environmental focus and make sure to have the things you desire, whilst also skipping unnecessary surplus items. See all the services we offer here. Here at the hotel you will always be able to sleep well. Book one night in one of our 5 unique suites and treat yourself to something a bit special. The suites are approx. 45 square metres large and decorated according to different themes such as "UrbanFriends", "GirlPower," and SportsSuite. In the top suite known as "The Eye" you can lie in bed with half your body in a "glass eye" out of the hotel and enjoy the view of the city of Porsgrunn. Book your hotel stay here and experience it for yourself! Torp Sandefjord Airport, 45 km - approx. 30 mins by car/taxi. Porsgrunn Central Station - 500 metres from the hotel. Porsgrunn bus terminal is 40 metres from the hotel.